Malaysia Airlines Flight 370 (MH370, also named under a codeshare agreement as China Southern Airlines Flight CZ748) is a missing Malaysia Airlines international passenger flight. The aircraft had 227 passengers and twelve crew members on board. 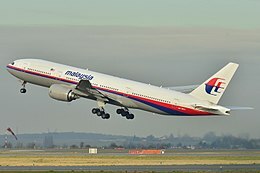 Flight 370 left Kuala Lumpur, Malaysia, at 00:41 on 8 March 2014 (MST; UTC+8) for a scheduled six-hour flight to Beijing, China. Subang Air Traffic Control Centre lost contact with the plane at about 01:22, while over the Gulf of Thailand. It was reported missing at 02:40. The United States Federal Bureau of Investigation (FBI) is investigating to see if terrorism is involved. Two passengers, one from Austria and another one from Italy, were named on the manifest. However, they were later discovered not to have been on board, their passports having been stolen. Meanwhile, Malaysian authorities are also ruling the identity of two other passengers to be false. On 29 July 2015, a flaperon was found on a beach in Saint-André, on Réunion island. On 5 August, the Prime Minister of Malaysia Najib Razak announced that the found flaperon was confirmed to be from flight MH370's aircraft. ↑ "Beijing-bound flight from Malaysia missing". USA Today. 9 March 2014. Retrieved 9 March 2014. ↑ "Terrorism not ruled out in disappearance of Malaysia Airlines jet". Chicago Tribune. 8 March 2014. Retrieved 9 March 2013. ↑ "Malaysia Airlines 'loses contact with plane'". BBC. 8 March 2014. Retrieved 8 March 2014. ↑ "Crash: Malaysia B772 over Gulf of Thailand on Mar 8th 2014, aircraft missing". The Aviation Herald. Retrieved 8 March 2014. ↑ "Passengers on Malaysia Airlines plane come from 14 countries, airline says". CNN. Turner Broadcasting System. 8 March 2014. Retrieved 9 March 2014. ↑ "Two more Europeans with suspect identities onboard missing MH370". Malaysian Insider. 9 March 2014. Retrieved 9 March 2014. ↑ Pete Williams; Robert Windrem; Richard Esposito (9 March 2014). "Malaysia Probes Identity of Four Passengers on Missing Jet". NBC. Retrieved 9 March 2014. ↑ Branigan, Tania (24 March 2014). "Missing flight MH370 lost in southern Indian Ocean, says Malaysian PM". The Guardian. Retrieved 24 March 2014. ↑ "Malaysian prime minister: Missing flight MH370 'ended in Indian Ocean and no one on board survived'". Metro.co.uk. 24 March 2014. Retrieved 24 March 2014. ↑ Sevastopulo, Demetri (24 March 2014). "Malaysia says data indicate MH370 crashed into the Indian Ocean". Financial Times. Retrieved 24 March 2014. ↑ "MH370 search: Plane debris arrives in France". BBC News. 1 August 2015. Retrieved 9 August 2015. This page was last changed on 28 February 2019, at 16:57.